Kareem Adam Rabbat formed an appreciation for nature from fishing with his father as a young boy, which eventually led him to join an initiative as an adult to find sustainable ways of getting fresh food to people. As a sophomore environmental engineering student at Pitt, Rabbat combined both his passions for protecting nature and his academic knowledge to become president of The Aquaponics Project — an initiative meant to provide food for communities using sustainable practices and energy-efficient means. Students from Pitt, Carnegie Mellon and the University of Michigan work together on The Aquaponics Project and develop a facility that provides both basil and fish for local communities in Pittsburgh. The facility was previously used by the students working on the project to educate the public about sustainable practices through tours. The students involved in The Aquaponics Project are now working on making improvements and are hoping the facility will start producing food for wider consumption this spring. The East Liberty facility consists of a 500-gallon fish tank housing tilapia with 30 grow towers — vertical structures within the tank that are capable of growing 27 basil plants each. 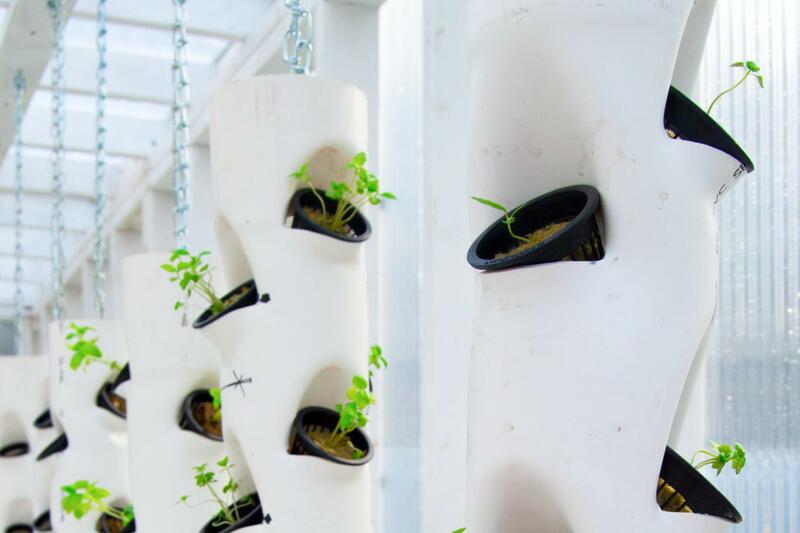 It operates through the use of aquaponics, a combination of hydroponics — growing plants in water without soil — and aquaculture, farming aquatic animals for food. Essentially, the facility creates a closed loop system that follows a circular flow. The waste products of the fish provides nutrients for the plants while the plants keep the water clean for the fish. The only input into the system is the food for the fish. According to Rabbat, the output is food produced in an environmentally sound way. “We’re really trying to attack the whole food issue from multiple perspectives so we can produce this food and distribute it to the community, but at the same time take food waste that would usually go to landfill and decompose [it],” Rabbat said. Catherine Schrading, a junior majoring in environmental science, co-founded The Aquaponics Project as a first year in 2015 alongside fellow first year and computer science major Vinh Luong with the intention of finding a solution for “food deserts” — communities across the globe without easy access to fresh, healthy foods. While the project did begin at Pitt, additional members from the other schools joined to bring a more varied approach with their differing majors, including information sciences and engineering. The original group met its new members from outside of class through volunteering opportunities and Pittsburgh’s environmental community, Schrading said. Farah Harb, the education program coordinator for the Ford Motor Company Fund, said the projects in the 2017 competition focused on sustainability and that mobility was also part of the challenge — either literal movement or social mobility. According to Rabbat, the team began designing the project in 2015. After a year of collecting grants, fundraising and coming up with a final design for the facility, they began constructing their farm out of a decommissioned shipping container, completing the facility in the summer of 2016. Rabbat said the system allows for 90 percent less water to be used for growing fish and plants compared that for traditional farming.The group had its most successful crop yield this past summer. The group has used their project as a teaching device for Pittsburgh residents. According to Schrading, the group has given tours to the community to explain how the project worked and how this was a sustainable method of procuring food because it produced little to no emissions. Rabbat said the group has also developed partnerships with several Pittsburgh organizations, including The Door Campaign, an organization that encourages STEM-based learning among young people. The Door Campaign at Savoy utilized the basil that the group grew for hors d’oeurves and drinks at an event last summer, according to Rabbat. The team plans on reinvesting their prize money back into their aquaponics project by adding on an anaerobic digester that will take on any food waste produced and convert it into energy. The group hopes to finish completing the digestor this spring. Schrading said finding funding for this device is one of the reasons the group entered the Ford College Community Challenge.